Simplicity in a sturdy package. Excellent build; Great Keypad; Hot-swappable external SIM slot; Decent sound quality; Easy to use interface; Well priced. No 3G or Wifi; Lacks USB port; Memory Card slot under the battery; No WhatsApp. Despite being an entry-level handset, the Asha 205 doesn't feel cheap at all. In fact, it's one of the best looking handsets you can get for slightly more than 3k. Upon close inspection, the fine texture on the back-panel and evenly distributed keypad backlighting shows Nokia's build precision and attention to detail. The QWERTY keypad is well spaced, and brings back the good old tactile response. 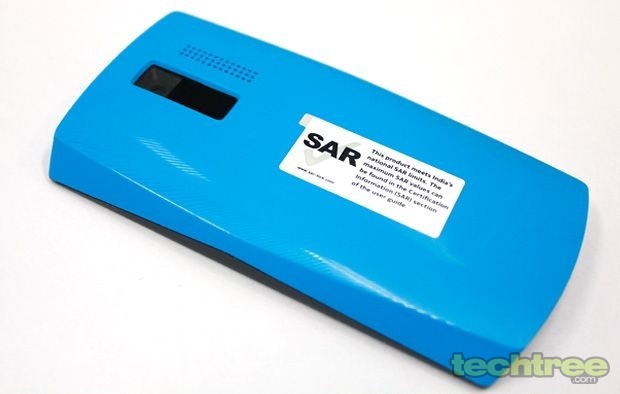 Undoubtedly, it's a treat for texting addicts. To woo the Facebook lovers, the handset features a dedicated FB button. Taking cues from the Lumia series, it comes in bold colours such as the cyan, magenta, orange, pink, and white. 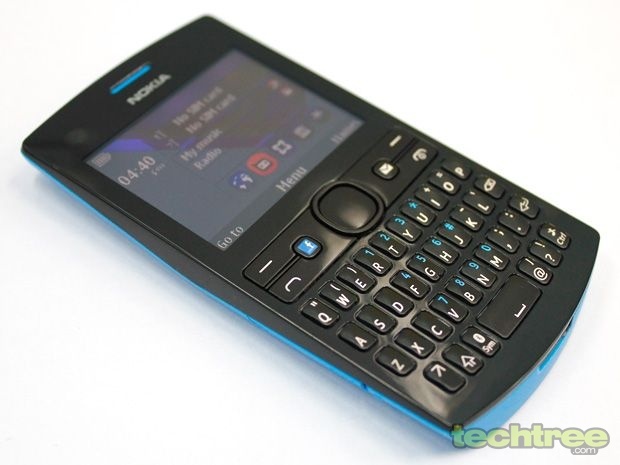 Compared to the Asha 200, this one features more straight lines and sharp edges. The build quality is great, and I'm sure the phone can survive a lot of bumps and drops. The handset's 2.4" screen has pixel dimensions of 320x240. Its colour reproduction is decent, but the viewing angles are strictly ok. But, then you can't expect anything better at this price tag. Thankfully, based on the user feedback for the Asha 200, Nokia has finally added an option to control the screen brightness. The Asha 205 comes with 64 MB of internal storage and microSD card slot (supports up to 32 GB). It features a VGA camera, charger plug, 3.5 mm jack, Bluetooth 2.1, FM radio, and 1020 mAh battery. Nokia has provided a hot-swappable external SIM card slot, but at the same time the microSD card slot is placed under a battery. If that wasn't bad enough, the phone lacks a USB-port, which means you either have to use a Bluetooth dongle or memory card reader to transfer media to and from this phone. The Asha 205 is based on Nokia's Series 40 platform. This Java powered handset offers easy-to-use interface. On home screen, you can add up to three widgets for quick access. Moreover, the Menu view can be organized into a list or grid view. As far as the customization is concerned, you can set a wallpaper and theme of your choice. Since it's not a smartphone OS, there's no proper multitasking. However, you can minimize the music player and perform other tasks such as sending a message or browsing internet. All in all, the user experience is reasonably smooth and user friendly. 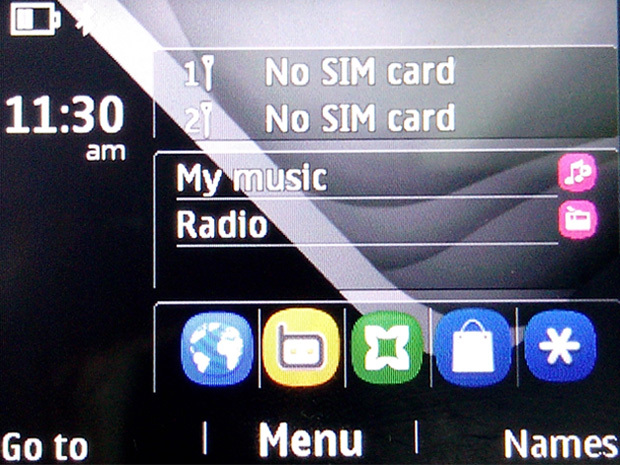 The Asha 205 comes with an interesting feature called Slam. Using this, you can directly send files to the closest device over Bluetooth without even pairing it. The feature works well with most of the smart and feature phones except for Windows Phone platform ironically. Apart from built-in apps for Facebook and Twitter, you get a pass to download up to 40 free EA games including Medal of Honor 2010 and Bejeweled for free. Nokia's Xpress browser compresses data to speed up the browsing and cut down your GPRS usage. WhatsApp client doesn't work with Nokia's dual-SIM handsets, and this one's no exception. So, if you're addicted to WhatsApp, go for the Asha 201 instead. The Asha 205 is a dual-SIM dual-standby handset, which means if you're busy on a call, your other SIM will be unavailable during that duration. 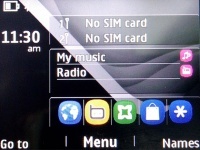 To organize two SIM cards, the phone offers a SIM management menu. The phone's network reception and call quality were excellent during the tests. The phone can play MP3, WMA, WAV, and AAC audio formats. The sound quality though earphones is strictly ok. It lacks the equalizer settings, but FM radio is duly covered. If you feel like watching videos on a 2.4" screen, you can play low bit-rate 3GP and MP4 files. The camera has been added as a token feature. It lacks a flash, and you know what to expect from a VGA camera. The 1020 mAh battery easily lasts for a over a couple of days. If your primary phone is an Android device, the Asha 205 can be a perfect backup handset for you. Available for around Rs 3300, this deivce offers excellent build quality, chic design, and user-friendly interface. 3G connectivity and a USB-port would have further sweetened the deal, but unfortunately some smart buggers at Nokia thought that these features would have been a tad too much for a phone in its price bracket. Despite these absentees, the Nokia Asha 205 is a very good phone for the price. In case you're hell-bent on buying a smartphone in this price segment, the Android 2.3 powered Micromax A25 Smarty (Rs 3300) is worth your consideration. That won't be such a smart buy though.